Traditionally water pipes were often made from cast iron. Internally many of them have a cement lining intended to prevent internal corrosion and in most cases this is successful. The main problem for older cast iron pipes is external corrosion. Corrosion of pipes buried in the ground sometimes occurs rather quickly and often is very uneven (seen as pitting, such as shown in Fig. 1) yet others have been found to survive and to remain operational for many decades. There are some cast iron water pipes still in operation after more than 100 years in the ground. Activity 3 focuses on developing simple mathematical models for predicting such corrosion. It uses data about the pipe and its operational and soil environment. This includes soil moisture content and the possibility of microorganisms attacking the cast iron or steel. The factors known to be involved are reviewed in Petersen and Melchers (2012). 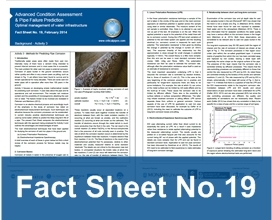 Corrosion is an electro-chemical process and accordingly much of the emphasis in the study of corrosion has relied on electrochemical measurement techniques. Such techniques are attractive because the corrosion processes can be accelerated. In current industry practice electrochemical techniques are used by some water utilities to predict the likely long-term life of a pipe. The present Fact Sheet compares the electrochemical techniques with the approach being employed for Activity 3 and outlines the advantages and disadvantages of each. A brief overview of each of these is given below but first a short review of the corrosion process for ferrous metals may be helpful.